University of North Carolina Press, 9781469647678, 296pp. 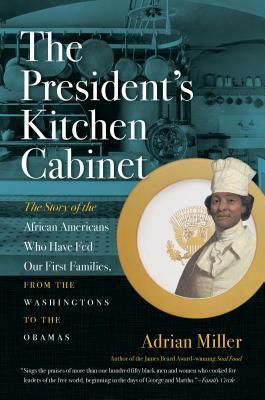 James Beard award-winning author Adrian Miller vividly tells the stories of the African Americans who worked in the presidential food service as chefs, personal cooks, butlers, stewards, and servers for every First Family since George and Martha Washington. Miller brings together the names and words of more than 150 black men and women who played remarkable roles in unforgettable events in the nation's history. Daisy McAfee Bonner, for example, FDR's cook at his Warm Springs retreat, described the president's final day on earth in 1945, when he was struck down just as his lunchtime cheese souffle emerged from the oven. Sorrowfully, but with a cook's pride, she recalled, "He never ate that souffle, but it never fell until the minute he died." A treasury of information about cooking techniques and equipment, the book includes twenty recipes for which black chefs were celebrated. From Samuel Fraunces's "onions done in the Brazilian way" for George Washington to Zephyr Wright's popovers, beloved by LBJ's family, Miller highlights African Americans' contributions to our shared American foodways. Surveying the labor of enslaved people during the antebellum period and the gradual opening of employment after Emancipation, Miller highlights how food-related work slowly became professionalized and the important part African Americans played in that process. His chronicle of the daily table in the White House proclaims a fascinating new American story.